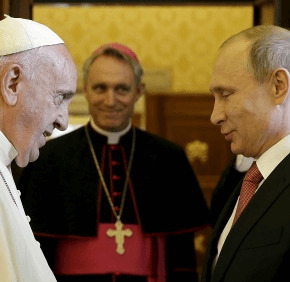 VATICAN CITY – When Pope Francis met Russian President Vladimir Putin at the Vatican June 10, the ongoing crisis in eastern Ukraine was the principal topic of their conversation and was a concern for many others as well. For the first time since 1998, the leaders of the world’s most industrialized countries – the so-called G-7 – held a summit in June 2014 and excluded the Russian president, citing the invasion of Crimea. They renewed their exclusion of Putin this year when the G-7 leaders met June 7-8 in Germany.